Here you'll find a Norwegian Bacalao Cod Recipe, and I may as well let you know, we have many varieties of this one. In Spanish, Bacalao translates to cod - but in Norway it is a popular seafood dish. Norwegian Stock Fish/Klippfisk (below) is the main ingredient for this delicacy. 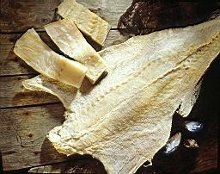 In Portugal, Spain, Italy, Greece, Brazil, the term is also used for stock fish (salted dried cod). In Norway, Bacalao is a "stock fish casserole" with olives, tomatoes, onions and peppers, but not always, because of the numerous recipes for this Norwegian fish dish. However, it is always made with cod as the main ingredient. For example, one recipe is called Lofotlao. This one is more prominent in Lofoten, Northern Norway. Kristiansund, is a city well known for their version of Bacalao. Other parts of the country have their own special way of making this cod casserole. In the United States, salted cod can be found in a 1-lb wooden boxes in your grocers meat department. If they don't carry it, ask for it. My nephew, Bent, has his own rendition for this savory and sometimes spicy dish. Here is Bent's own Bacalao Cod Recipe. Change water every 4 hours. pimentos, jalapenos, wine and simmer. shredded fish, salt and pepper. Serve with Greek or Italian bread and salad. And of course, don't forget your favorite bottle of wine. Skål! Norwegian Recipes Norwegian Paella? - Give me a brake.